The Zebra QL220 direct thermal mobile printer has been designed with the most advanced technology in rubberized over-molding to maintain both rugged construction and minimal weight. Contact us today about buying, servicing, renting or selling QL220 gear! To keep your business moving, the Zebra QL220 provides many user-friendly options such as center-loading media, smart battery monitoring, and an optional LCD. 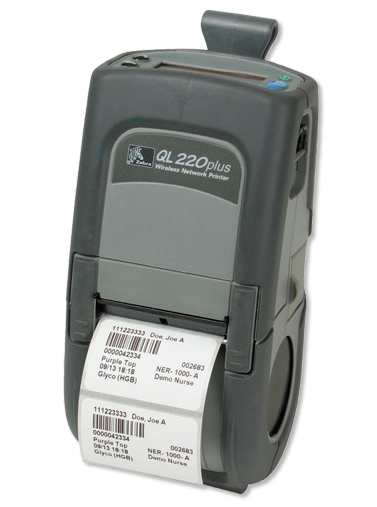 The QL220 Plus is ideal for many applications, including price marking, shelf labeling, inter-store transfers, direct store vendor delivery and verification, and for mobile point-of-sale anywhere space is at a premium. The QL220 Plus’s QuickLink modules, with Bluetooth or 802.11b radios, offer the flexibility to adjust to a wide range of connectivity needs. Contact us today about buying, servicing, renting or selling QL220 gear!